Michael Gordon's "Van Gogh" will be featured in LBO's 2013 season. 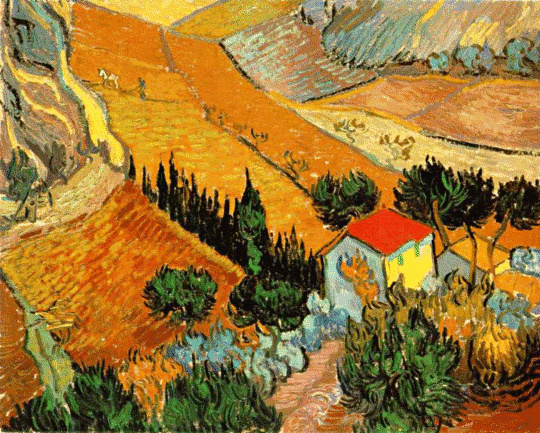 "Landscape with House and Ploughman" is believed to be in public domain. What follows here is Long Beach Opera‘s official press release. June 29, 2012 (Long Beach, CA) – Long Beach Opera Artistic and General Director Andreas Mitisek today announces the company’s 2013 plans to produce five rarely performed 20th and 21st century operas. The season’s theme is “Borderline” and the scheduled productions are the U.S. premieres of Gabriela Ortiz’ Unicamente la Verdad and Stewart Copeland’s Tell-Tale Heart, the Western U.S premiere of Michael Gordon’s Van Gogh, the West Coast premiere of Philip Glass’ The Fall of the House of Usher, and the Professional U.S. premiere of Ernest Bloch’s Macbeth. Four of the five – Ortiz, Copeland, Gordon, and Glass – are living composers who actively contribute to today’s music scene. LBO will be staging Glass at the Warner Grand Theatre, San Pedro; Ortiz at the Terrace Theater, Long Beach; the double bill of Copeland/ Glass at the EXPO Art Center, Long Beach; and Bloch at the Port of Los Angeles, San Pedro. Complete cast and production information will be available at a later date. percussive storm, Glass’ haunting 1987 score for Edgar Allan Poe’s macabre masterpiece provides the perfect backdrop for this nightmarish journey to the edge of madness. Ken Cazan, who staged LBO’s acclaimed The Cunning Little Vixen, will direct. Returning to the venue of last season’s Maria de Buenos Aires, LBO will present three performances of Usher at the beautiful Warner Grand Theatre. Once called “The Castle of Your Dreams,” the art deco movie palace is the perfect venue for this ghostly tale of a mysterious mansion with an apparent life of its own. The opera marks LBO’s first co-production with the Chicago Opera Theater (COT) under the joint directorship of Andreas Mitisek. COT will open the work on February 23, 2013. On March 24 and March 30, 2013, LBO stages the U.S. premiere of Unicamente la Verdad (Only the Truth), a controversial work dealing with love, drugs and betrayal along the US-Mexican border. Mexico’s foremost female composer, Gabriela Ortiz, and her brother, Los Angeles and San Diego-based artist Rubén Ortiz-Torres, created this timely video-opera. Camelia “la Tejana” and her lover are drug traffickers smuggling marijuana from Mexico to Los Angeles until betrayal by one turns the other into a killer. Based on newspaper accounts and inspired by the ballad “Contrabando y Traición” (Smuggling and Betrayal), this explosive docudrama is set to contemporary music, incorporating the accordion and tuba of Northern Mexican corridos (ballads), and presented against graphic film footage. First developed in a November 2008 workshop at Indiana University Jacobs School of Music, the final version premiered in 2010 at the Festival de Mexico in Mexico City. Unicamente la Verdad will be staged at the Terrace Theater in Long Beach, CA..
Gabriela Ortiz’ work has been commissioned and performed by the Los Angeles Philharmonic (conducted by Salonen), the Kronos Quartet, and Dawn Upshaw, among others. Ortiz has won many awards including Guggenheim and Fulbright Fellowships for Unicamente La Verdad. Rubén Ortiz-Torres’ work is widely recognized and part of the permanent collections of many museums, including the Los Angeles County Museum of Art. Besides being a painter, video artist, and photographer, he is on the faculty of the University of California San Diego. A double bill of delusion and illusion begins May 11, 2013, when LBO stages four performances of Tell-Tale Heart, a U.S. premiere, and Van Gogh, a Western U.S. premiere, at the EXPO Art Center in Long Beach, CA. Both works feature music at the edge of rock, jazz, and classical modernism. Best known for performing with Sting and his other band mates, Copeland is also an accomplished and versatile composer whose operas, ballets, symphonies have been presented by Ballet Oklahoma, Seattle Symphony, and Cleveland Opera, among others. His many film and television scores include the soundtracks to Wall Street, Talk Radio, and Airbourne. Based on Van Gogh’s letters to his brother Theo, this moving work explores the fine line between madness and genius. “What attracted me so much to Van Gogh’s writing was the pain, rawness and brutal honesty,” says American composer and Bang on a Can co-founder, Michael Gordon. “I found it hard to believe that anyone could tell another person, even his brother, the raw emotions that Van Gogh experienced – so painful, so lonely, so humiliating.” In 1991, the work premiered in New York to critical acclaim and was later performed in Vienna, Austria. In 2003, Gordon re-orchestrated Van Gogh and Crash Ensemble, an interdisciplinary Irish music group, premiered the new version in Dublin the same year. Conductor Alan Pierson of Alarm Will Sound comments, “The Van Gogh opera is amongst my favorite Michael Gordon works: it’s hard-hitting, edgy, but includes music of impassioned lyricism.” Van Gogh is dedicated to fellow composer and Bang on a Can co-founder, David Lang, whose opera,The Difficulty of Crossing a Field, was performed by LBO in 2011. From June 15 to June 23, LBO closes the 2013 season with Swiss-American composer Ernest Bloch’s re-discovered powerhouse, Macbeth. Based on Shakespeare’s play, the opera tells how ambition, a manipulative wife, and witches’ prophecies spur a Scottish general on a path toward treason. Bloch’s version draws directly from the original Shakespeare text, using lines from the play to propel the action forward. The opera premiered in 1910 at the Opéra-Comique, Paris. In 2009, University College Opera London presented the UK premiere with Bloch and Alex Cohen’s 1951 English libretto. Commenting on the production in Classics Today, Robert Levine wrote, “Where has this opera been hiding?…It deserves wider hearing – it’s a masterpiece.” Conductor Charles Peebles says of Bloch’s music, “Every chord is brilliantly calculated and there is a polish about the whole opera that is amazing…When all is gathered up, Macbeth’s absence from the operatic schedules of the world opera houses is more surprising than most.” LBO will be the first professional U.S. company to stage this important work. Bloch’s dramatic opera will receive site-specific staging at the Port of Los Angeles, San Pedro. Tickets: Subscriptions go on sale today. First- time subscribers receive a 50% discount. Contact the LBO Box Office at 562-432-5934. Subscriptions will also be available online at www.longbeachopera.org. COMING SOON in 2012: Before the new season begins, science meets opera at the water’s edge when LBO presents the U.S. Premiere of Gavin Bryars’ The Paper Nautilus, the first production of its new chamber series “Outer Limits.” Performances will take place on September 7, 8, and 9, 2012 at 8:00pm at the Long Beach Aquarium of the Pacific. This new initiative is supported by The Andrew W. Mellon Foundation. Long Beach Opera (LBO) is internationally known for cutting-edge interpretations of unconventional repertoire. LBO creates immediate, inventive and often boldly avant-garde productions for an adventurous audience and stands apart from most other companies in the number of world, American, and West Coast premieres it has staged. Founded in 1979, LBO is one of the largest professional opera organizations in Southern California and the oldest in the Los Angeles/Orange County region. LBO’s performance history includes more than 90 operas ranging from the earliest works of the 17th century to new operas of the 21st.